Narcissisit's and sociopaths in our world make it hard to trust others, especially when we have been victimized by one. A victim feels alone and isolated. When the relationship goes sour the sociopath goes on a campaign to destroy your reputation, and make your life so miserable and difficult. They hope you take your own life. The victim has to keep up their guard and protect themselves from the abuse and the trouble and pain that the sociopath/narcissist can cause. Being in an intimate relationships with a sociopath can cause severe emotional damage to our soul. Victims are often physically assaulted and emotionally beaten and injured. 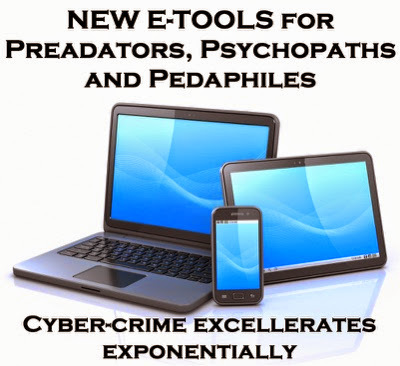 With all the new age technology sociopaths use the Internet to do the majority or their dirty work. They are online bullies. They are able to use a veil of anonymity to harass, threaten and stalk their victims. Sociopaths torment their victims by impersonating them online in a unfavorable manner. They may post vulgar pictures of their victim. They are creative in how they torment their target. Sometimes they pretend to be the victim. All while vilifying the victim. They are trying to get others to hate the victim - so the victim feels they do not have anyone to turn to. Fortunately there are now some state and federal laws against cyber-stalking and harassment. Unfortunately they are not always enforced and can be difficult to get enforced. The more knowledge we have on sociopaths, psychopaths and narcissist. The less likely we will become victims. The road to recovery is a long one, and sometimes it feels as if the horror never ends. If children have been brought into the relationship. Then the hell last longer. The psychopath will use the children as a tool against you. To hurt you. To harass you. To bother you. To cause you pain and suffering. Remember the psychopath HATES you more than they love their children. The children are seen only as the psychopaths weapon to hurt you more with.